Dillon residents packed into the town hall last week to discuss the future of the town core on Thursday. One of the excercises they went through was identifying valuable sight lines in town and marking areas where they would like to see improved connectivity on a map. Change is coming to Dillon. The question is, how much? Dozens of residents packed into the council chambers at Dillon Town Hall on Thursday night to attend a community meeting on the future of the Dillon Town Core. The meeting provided a chance for guests and town staff alike to debate the merits of different types of development in the area, and to find the consensus balance between the imperative of growth to maintain resilience — the town’s ability to rebound from economic downturn or natural disaster — and preserving the sense of community. Kerstin Anderson, director of marketing and communication for Dillon, began the meeting with a presentation outlining challenges the town, and surrounding areas, are facing in becoming more resilient. Anderson pointed to a study of “Economic Resiliency in Summit County” recently published by Stephanie Copeland, executive director of the Colorado Office of Economic Development and International Trade, along with Elizabeth Garner, state demographer with the Colorado Department of Local Affairs. The report dives into the county’s demographics and economic trends, highlighting several challenges faced by Summit towns. According to the study, Summit County’s population is growing at a rate of 1.6 percent a year, though the demographics show a clear age disparity in migration patterns. While Summit appears to be a highly attractive living destination for people in their early 20s, relatively low wages in the area are driving out young professionals by the time they reach their late 20s. “We see that a lot of people come when they’re about 20 or 21 right after they get out of school,” said Anderson. “We have a highly educated young population. They stay for a couple years, and by the time they’re reaching their early 30s they’re migrating back out. People are finding that it’s not affordable to live here, so they’re migrating to raise families, to find better earning potential and better wage jobs. Part of the problem is a clear lack of high paying jobs in the county, something Dillon would like to see addressed with new development. According to the report, the average Summit resident makes $733 a week (2016 statistic), more than $300 a week less than the average Coloradan. Another issue is businesses struggling to maintain revenues during shoulder season, and for Dillon, a relative lack of sales tax revenue from the town core. The Dillon Ridge Marketplace, the town’s biggest retail center, contributes more than $350,000 a month in sales tax revenue during both the summer and winter, but under $270,000 a month during shoulder season (April-May, October-November). Activation in the town’s core is comparatively small, averaging about $65,000 a month in the summer, $56,000 a month during winter and just over $30,000 during shoulder season. Following the presentation, town residents had a chance to inject their own values and ideas into the conversation surrounding the future of the town core. Though few specifics were discussed, residents were clearly able to form something of a consensus in terms of what they want to preserve in town, and what they hope to see in the future town core. Perhaps the most common theme talked about was providing incentive to bring residents and visitors to the town core, and providing a “sense of place” unique to Dillon. Residents stressed walkability throughout town, preservation of the lakefront, year-round access to the lake, adequate parking, the preservation of parks and landscape, seasonal markets and more as keys to the new town core. 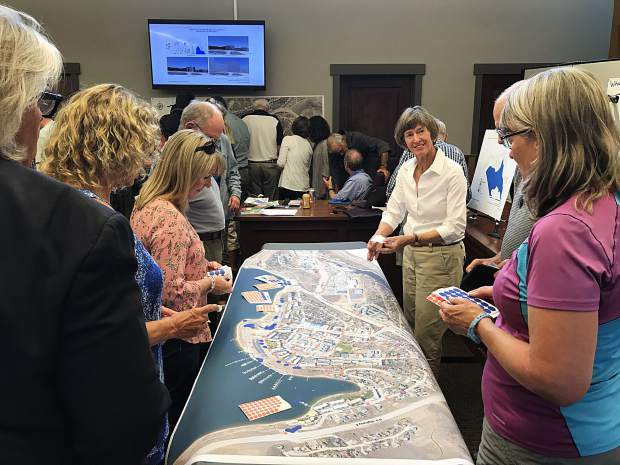 In addition, the group discussed the possibility of narrowing Lake Dillon Drive, zoning to better support small businesses, bringing more visual and performing art features to the core, and sound abatements to play into the small town atmosphere. But the pervasive message to town staff, and to Portmanteau — the town’s development partner working to create a design charette for the core — is that growth can’t come at the expense of quality of life. Residents bought into Dillon on the basis that it would remain a small mountain town, and they want it to stay that way. Much of this sentiment will play into the eventual master plan and architectural designs that will go into the revitalization process, though it also creates difficulties in building the desired increase in density in the town core. Tall buildings may be cheaper to develop, and more efficient in creating the town’s desired density increase, but its clear that tall is not what residents want. The revitalization process is still in its infancy. Portmanteau, fronted by president Bill Moore and architect Andrew Dalzell, will continue to take feedback through meetings with the public and town staff, eventually delivering a new master plan for the core. In addition to pubic input, Portmanteau will also have some auxiliary help with the planning process from the University of Colorado. Meghan Boydston, a master of urban and regional planning at CU Denver, recently prepared a report envisioning development in Dillon as her capstone project. Likewise, students from the CU Denver College of Architecture and Planning went to work on Dillon’s future this summer, developing their own vision for the town and its core.